We all love shipping code to production fast and with zero downtime. But while most changes require no downtime to be deployed, there are production changes that require for the entire site, or at least parts of it, to be taken offline for maintenance. Some database migrations are bigger than others, some component changes are not as fluent as others. 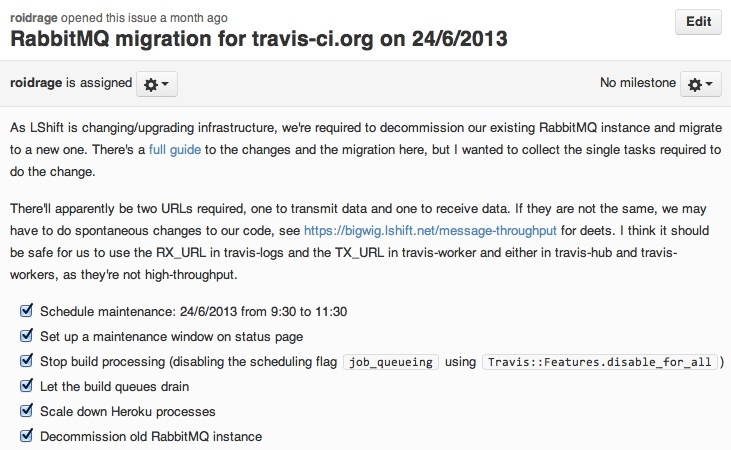 For instance, we’ve had to switch our RabbitMQ instance several times. Unless it was an emergency maintenance, we found that there are some steps that are essential to prepare for an upcoming maintenance, to make sure it’s going as smooth as possible. It’s important to give your customer notice to prepare for the upcoming disruption. The more bound your customers’ daily workflow is to your product, the more important it is to give enough notice for them to prepare for your site to be not available. To reduce the impact of bigger maintenances, we tend to move them to the weekends, if at all possible. It pays to have a status page for this and a feed your customers can subscribe to. For a bonus, include the notice prominently in your application. We use StatusPage.io for this purpose, and we have an internal broadcast system which we use to notify our customers of upcoming disruptions. Make sure to give updates as the maintenance progresses, in particular if it extends the expected window of downtime. This is a matter of operational transparency, and a courtesy to your customers. As the maintenance window approaches, sit down and think about all the steps involved for a successful migration. While this doesn’t need to be an exhaustive lists, it’s good to have as many steps as possible in here. Include steps to prepare maintenance, to carry it out, and to verify that it was successful. It will not only give you a book to play by, it will give you time to think about every single step and its potential side effects. It also allows you to prepare scripts for steps that lend themselves nicely to be automated during the maintenance window. Thinking about and preparing for all these details gives you confidence for the task ahead. I found this to be one of the most important steps to prepare for a maintenance. Just like handling outages, it’s handy to have another person around. It gives a sense of security, and it gives you someone to sanity check every step of the maintenance with. On top of that, you can work on the tasks in parallel. While preparation is key, execution is where the rubber hits the road. Having someone around who can interact with customers, update the status page and run validation commands is very handy. Not every maintenance window goes as planned. There may by hiccups, things that have unexpected side effects, and things that go downright wrong and cause an extended downtime. It’s important to follow up a problematic maintenance with an internal post-mortem. It doesn’t always have to be a public one. We use internal GitHub issues for this purpose. It’s more important for your team to learn from what went wrong and improve code, infrastructure and procedures accordingly to reduce the risk of it happening again in the future.